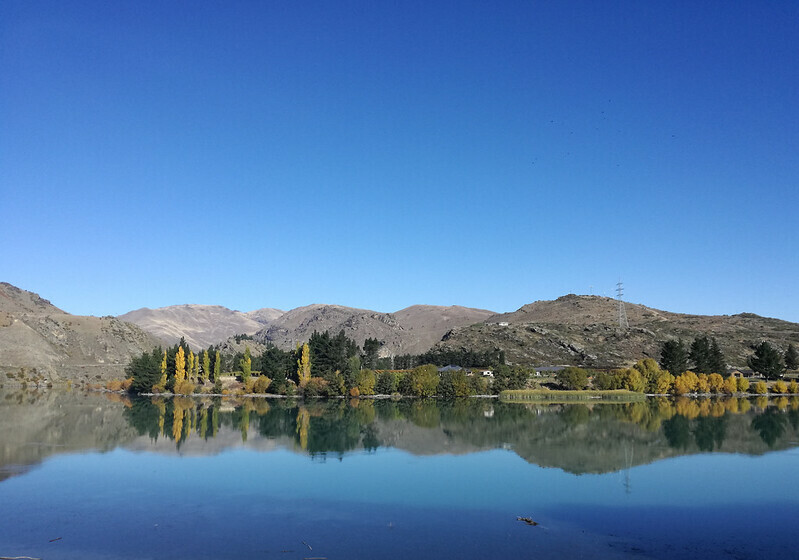 The pretty and peaceful town of Cromwell is the ideal base for travellers. 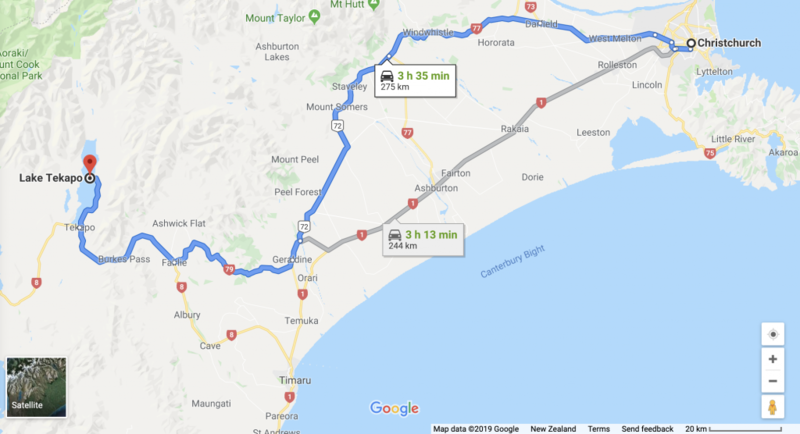 And that’s because Cromwell is just a short drive from busy Queenstown, Wanaka and those great wine areas. 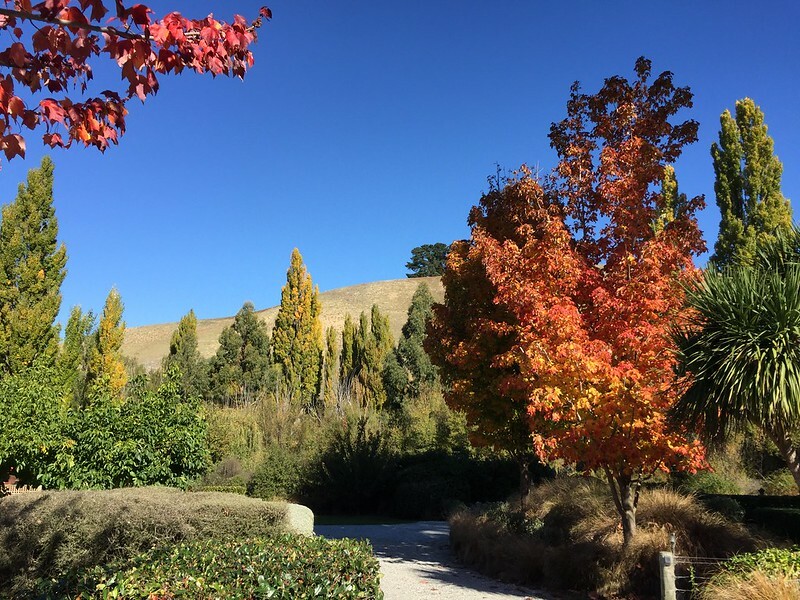 There really is no better time to stay here than in the beautiful months of Autumn – view details on New Zealand seasons. From April to May, the Autumn golds and reds are just awe-inspiring. 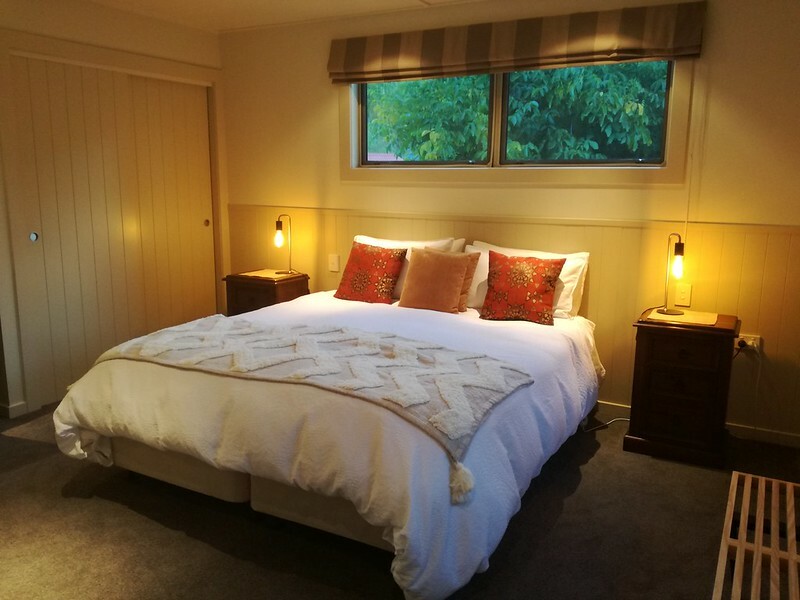 But a stay in Cromwell is also an excellent choice for repeat travellers. 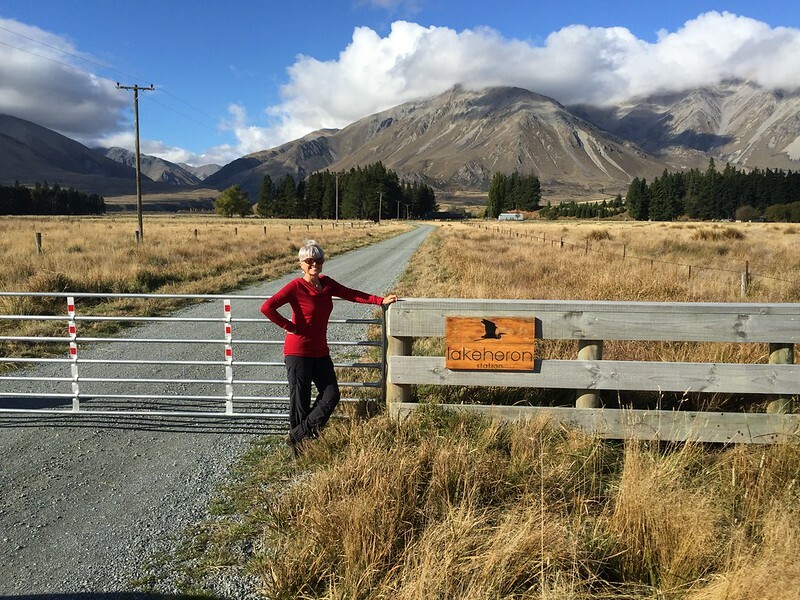 Most of you would have stayed in Queenstown or Wanaka on your first time. So maybe, you’re a bit over the resort towns where peace can be a foreign concept. 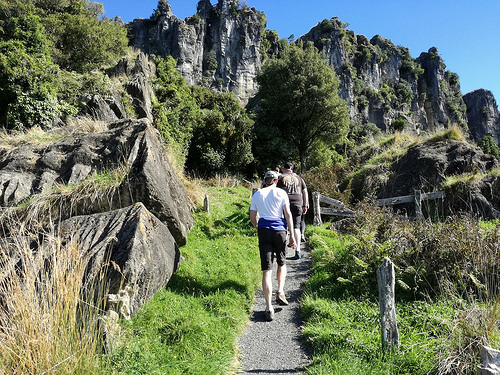 Even if this is not your first time to New Zealand, we would strongly recommend going on day visits to these busier places. And if you’re not hotel people, a self-contained cottage like this, might just be what you are looking for. This is a special oasis that really does live up to its name. Burn Cottage Retreat sits on a huge acreage. You will very quickly get a sense of tranquility here. There are only 3 cottages on this large property and they are quite a good distance away from each other. We stayed in the Moonlight Cottage. I guarantee, if you are looking for space, you will find it here. And after a long drive, your cottage will be warm when you step in. Co-owner, Cecelia, will have lit the fire a few hours before you arrive. This type of service is so appreciated, especially in the colder months of Autumn. Yet again, it really is about those special touches that only a boutique accommodation can provide. Beautiful walnuts in a bowl just waiting to be cracked. And do not be surprised if you Cecelia appears at your door with hot scones! After breakfast (a continental breakfast is optional) do take time out to explore the grounds. There are very special little nooks and crannies where you can hide away and read a book. 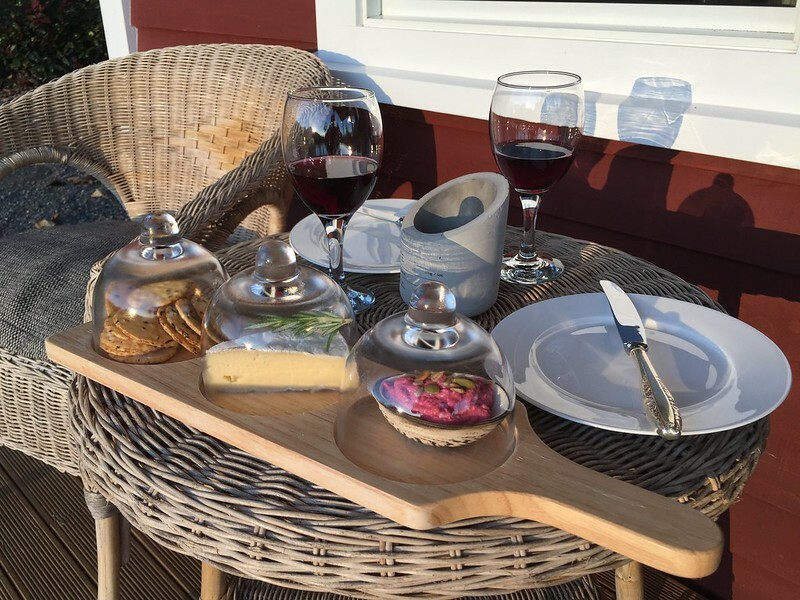 With only 3 cottages on the entire property, you will find a special place where you can truly enjoy solitude. 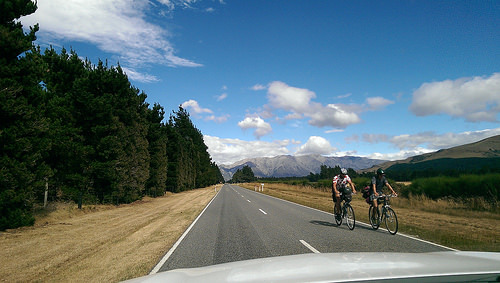 Grab a bike at the cottage or take your car into the historic part of Cromwell. It is here, you can become fully immersed with the landscape. 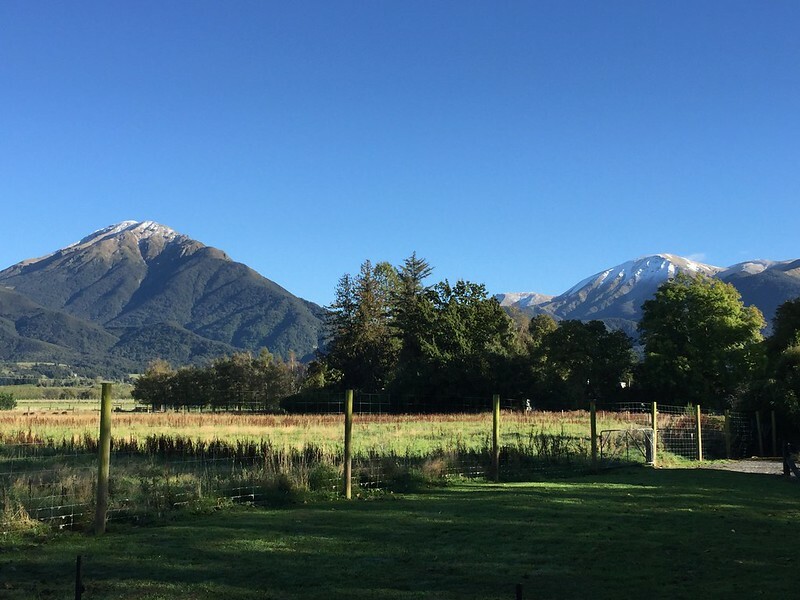 You will love the most spectacular views at Lake Dunstan – plus the relaxed small-town vibe. Take a wander around at your leisure to the old shops. These old buildings are heritage protected and have been restored for future generations. 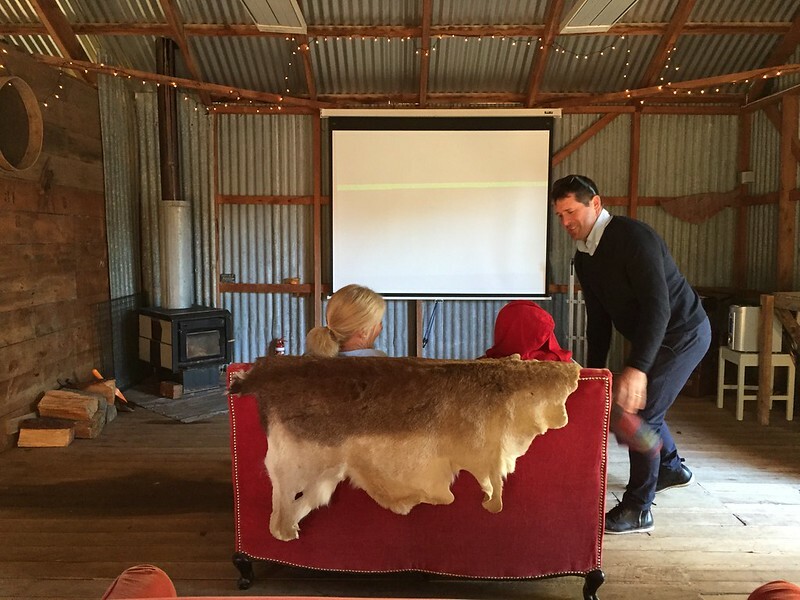 Pop into the Seed & Grain Store for a coffee and a chat with the locals. Everyone here seems to be friendly. 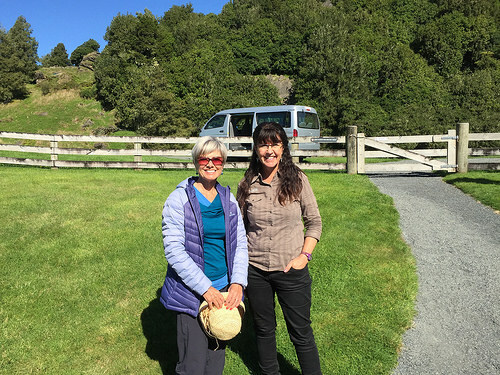 There is a Jet Boat company in Wanaka called Wanaka River Journeys. This company are owned and operated by a local family. They have a number jet boating options, one of which is called Jet Boat and Wilderness Walk. This one is a great option if you are a little time short. It is a half-day tour and an absolute blast! 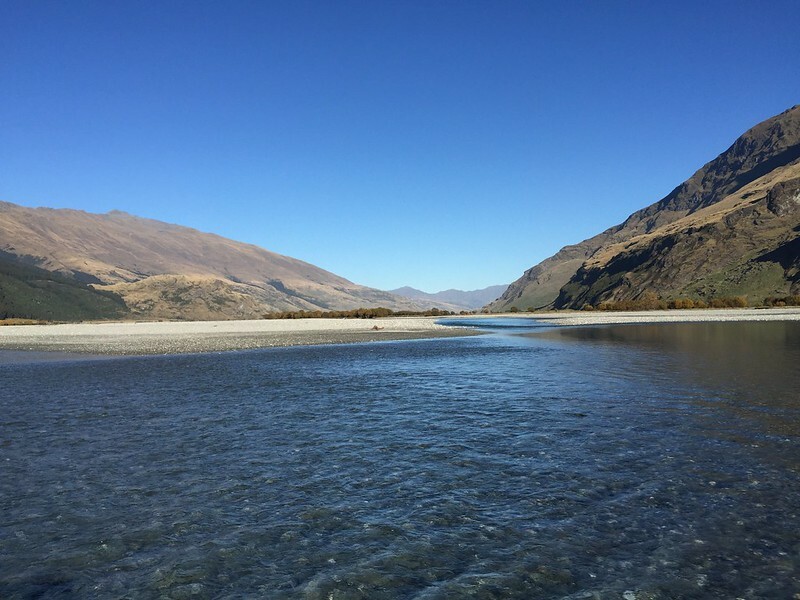 There is nothing more exhilarating than jet-boating down the Matukituki River. And you will really get off the beaten track here. 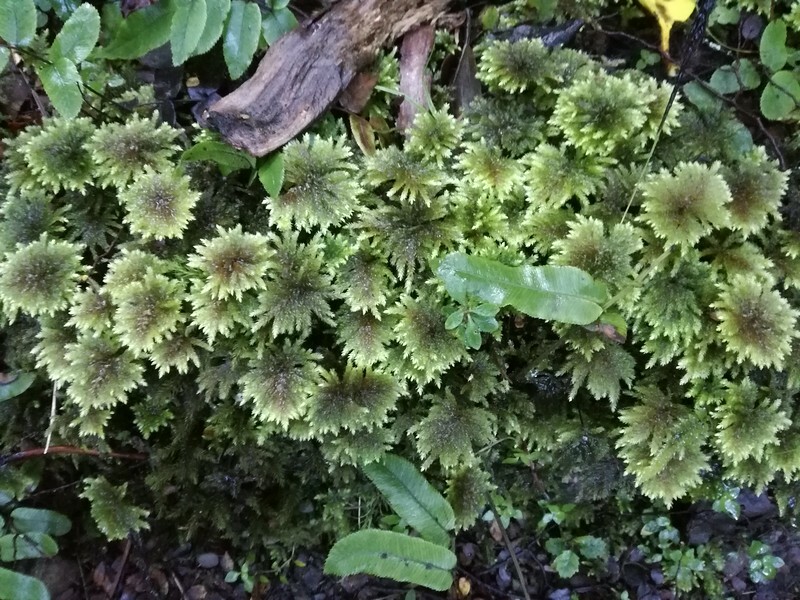 You will have a 50-minute walk that will take you through moss covered forest and waterfalls. 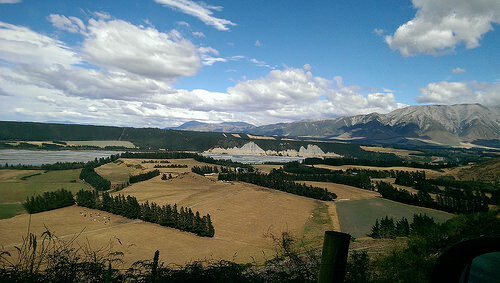 Yet again, you will see firsthand another location that was used for the LOTR films. And you will get to heat the wonderful stories about this landscape. You will have so many photo opportunities. 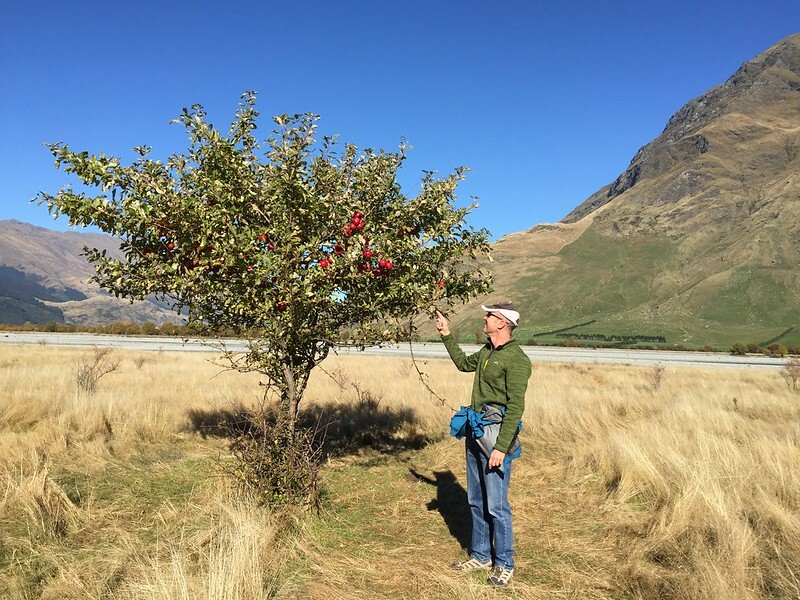 And often on these trips you will come across something totally unexpected – like this apple tree thriving in the middle of nowhere! 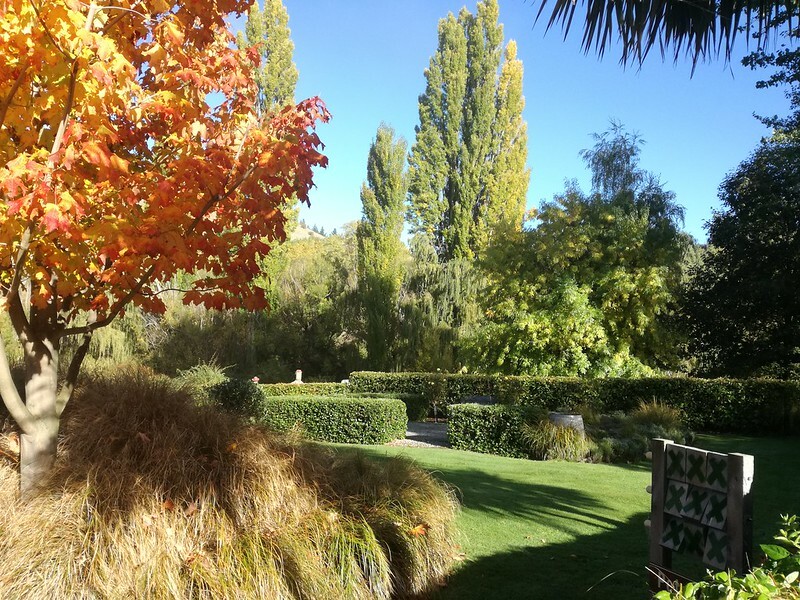 We paid a visit to a Wanaka B & B accommodation named Copper Beach – and found an unexpected gem. The owners, Yvette & Ian led us to their large garage and look what we found – this shining beauty! 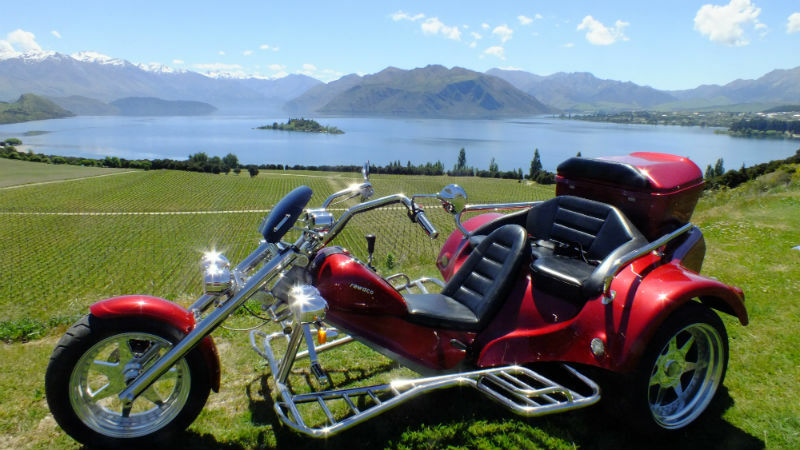 So if you are looking for a wine tour with a difference, you might consider a Trike wine tour. Especially on a hot summer’s day, it would be so good to engage all your senses. 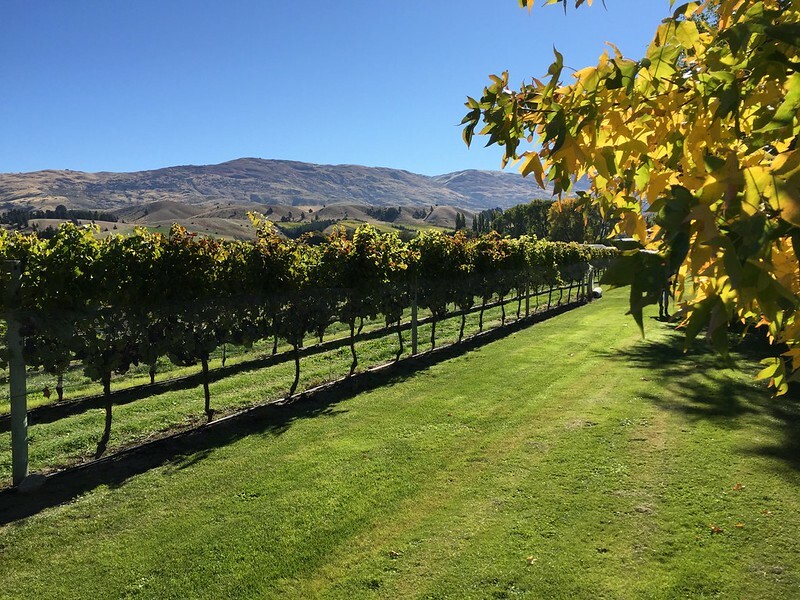 There are so many vineyards around Cromwell and the Bannockburn area nearby. And many of them provide great lunch restaurants overlooking their vineyards. In fact, a lot of these wineries will provide amazing lunch platters. Wooing Tree, Mount Difficulty and Scott Base are just a few of them. Now for night dining you will get a choice of some great options. 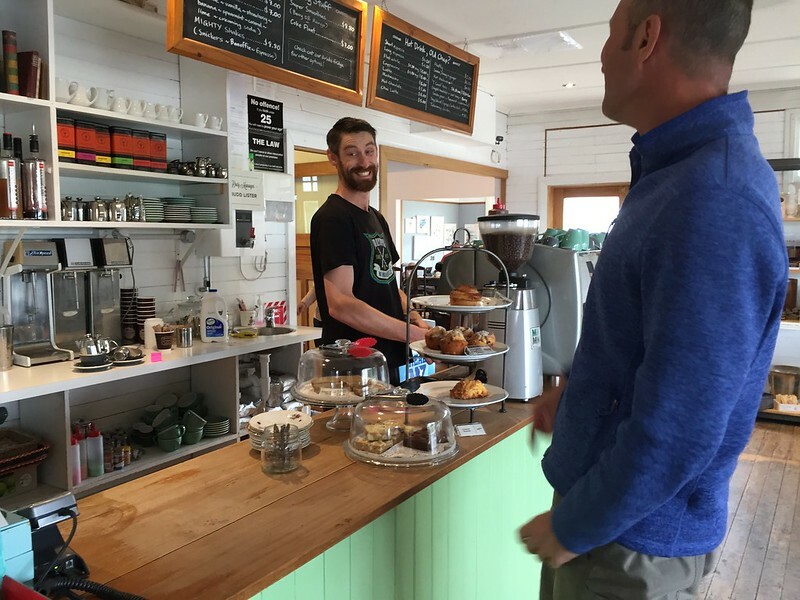 We have heard some wonderful things about Kika in Wanaka. 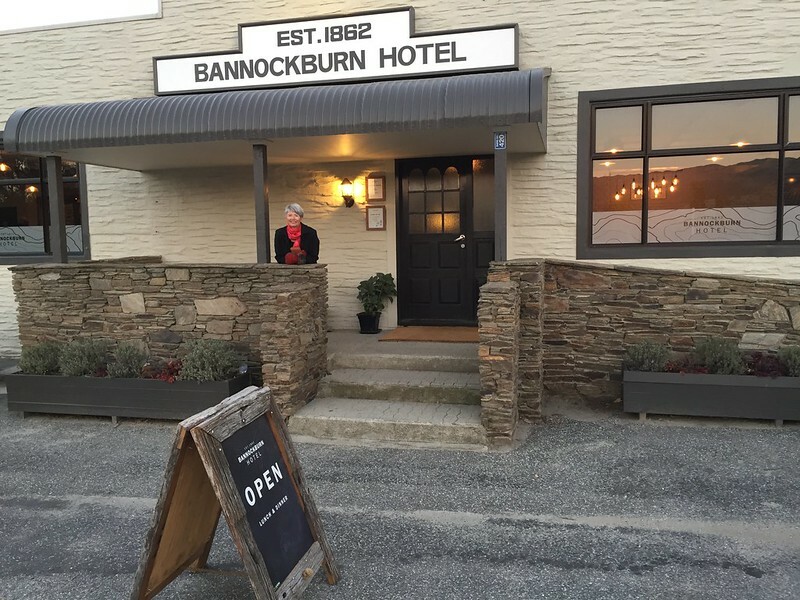 However, if you want to immerse yourself in the local scene, you can’t go past the historic Bannockburn Hotel. 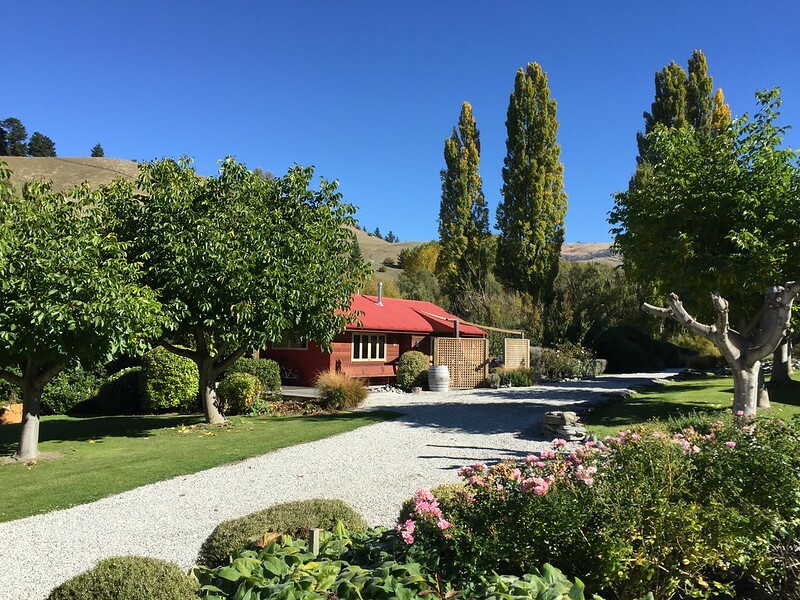 The Bannockburn Hotel is about 8 kms out of Cromwell. They have included separate tapas menu – plus the biggest wine list you will ever see. We dined here recently and can’t say enough good things about the food. The atmosphere was wonderful – definitely not your usual pub decor. And it is worth mentioning, that they also have a courtesy shuttle van that will pick you up and drop you off. 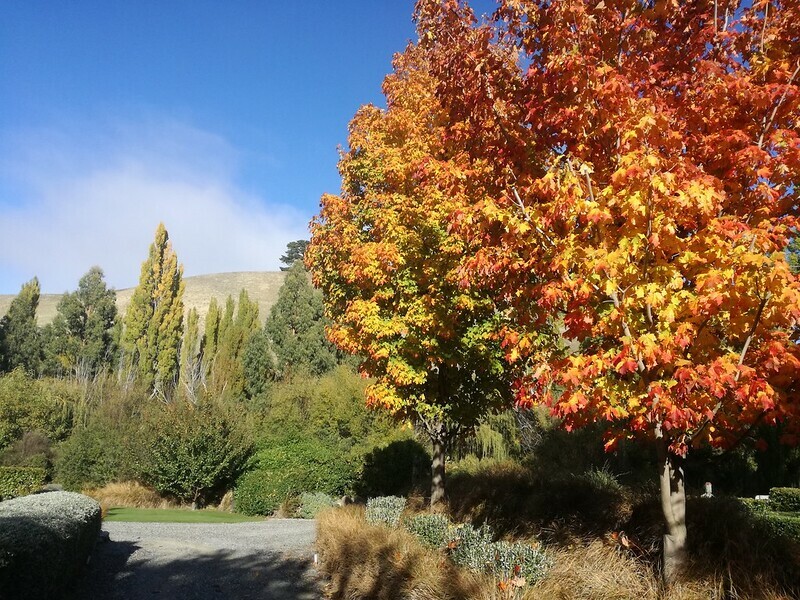 There are so many reasons why Autumn is such a wonderful time to visit Central Otago. There are less people around and plenty of adventures to be had. It is actually a time when nature is at its finest before settling down for a well deserved nap. 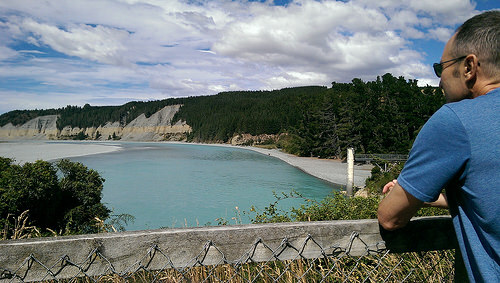 Check out some sample South Island travel itineraries. 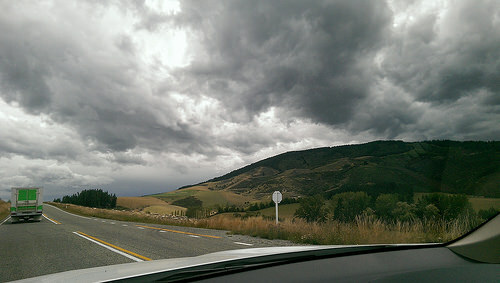 Happy Travelling through Mid Canterbury! 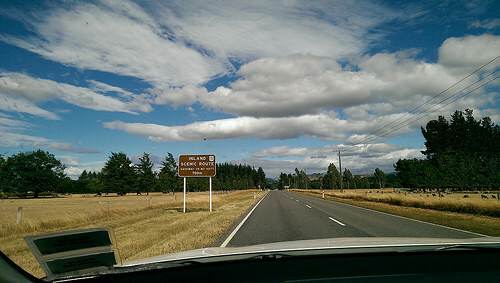 Today, we traveled just 45 minutes from the famous Waitomo Caves to Piopio. Where is that, you might well be asking! 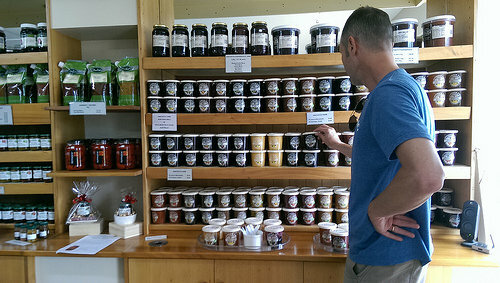 Piopio is a small farming township right in the middle of State Highway 3. Naturally, it isn’t a place that tourists will have heard of. Many would drive right on by. 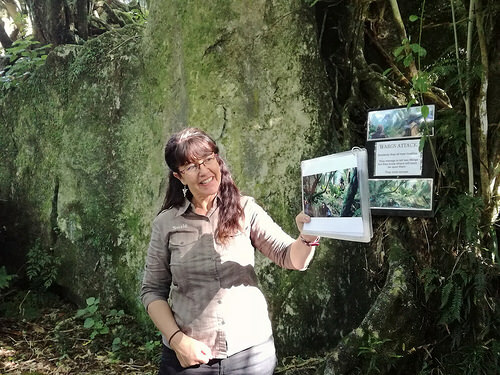 But this area has a real gem; Hairy Feet Tours may no longer be a hidden secret, but many travellers still have no idea about this fantastic offering. 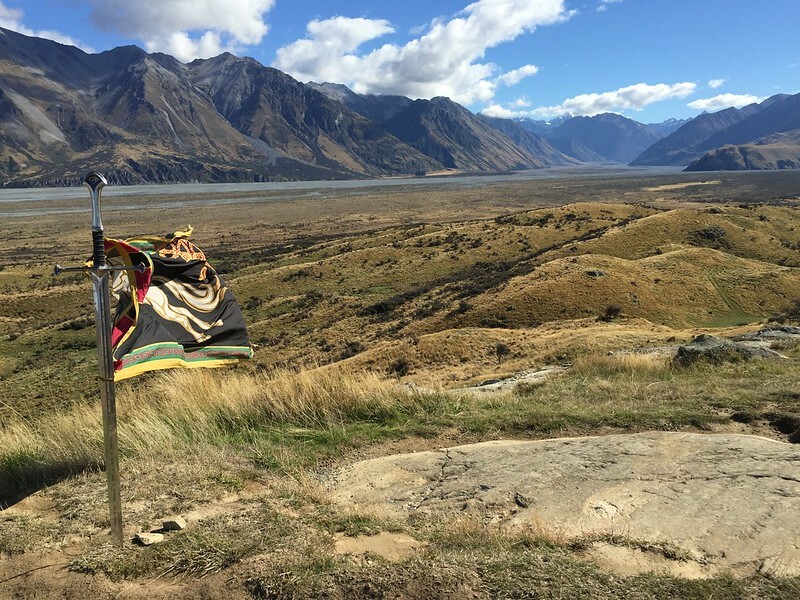 We all know that New Zealand attracts its fair share of Tolkien enthusiasts (or perhaps all of them!) and many want to hit the ground running, taking in as many filming locations as they can. 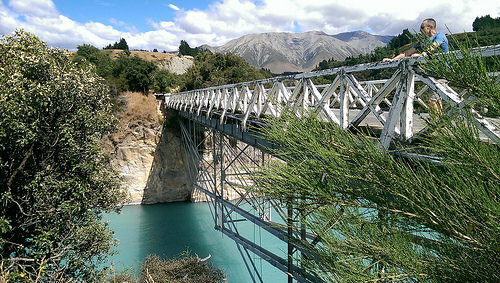 The Queenstown/Glenorchy locations are the most famous, and so some of the busiest. If you want to get a slightly more intimate and personalised experience, you should set your eyes a little further to the north. The shoot took a whole 8 months of planning a solid week of shooting. In the end, it was on-screen for just 22 minutes! It doesn’t sound like a lot, but that is actually a lot in screen time; more than almost anywhere else in the film! It certainly makes you realise how many hundreds of locations make up a film that is over two hours in length. The scene in question? The Trollshaws Forest scene! One of the best things about this tour is that you don’t have to be a Lord of the Rings buff to enjoy it. Anyone who has a love of nature and the outdoors will find something to love here! Also, if you have ever been curious about the details of a working farm, this tour puts you right in the middle of it. Hairy Feet Tours run two tours each day, at 10am and 1pm, with each lasting for around 90 minutes. This makes it a great short activity that you can easily fit into a busier day on the road. They use a mini-van to transport guests right up close to the key filming sites and allow you to have a good explore around the area. 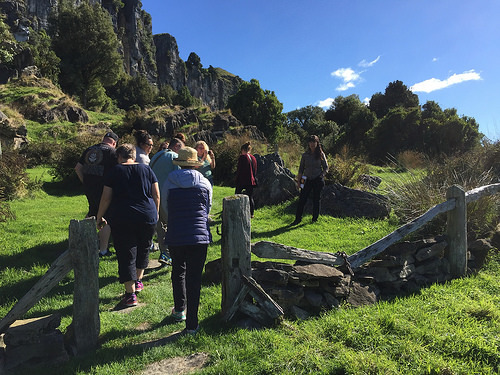 In New Zealand, it can sometimes feel like you are tripping over film locations, but some of the most beautiful are pretty inaccessible to tourists. By contrast, Hairy Feet Tours doesn’t take you too far off the beaten track. 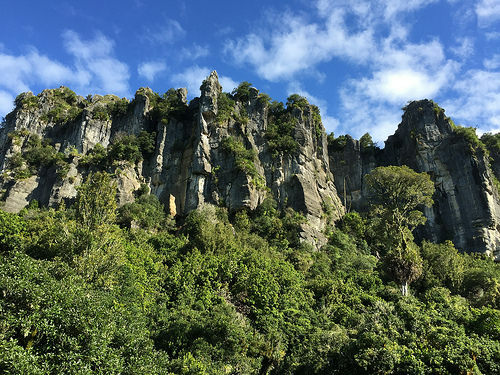 It’s only a 45-minute drive from the Waitomo region. So if you have a bit of spare time, we highly recommend! Our tour started from the moment Suzie greeted us at her modern reception area. Suzie runs the tours herself, and takes a lot of pride in the operation. After all, this farm has been in Warrick’s family for three generations! This is a predictable photo I know, but at 6ft.2in, Michael wouldn’t make a very good Hobbit! 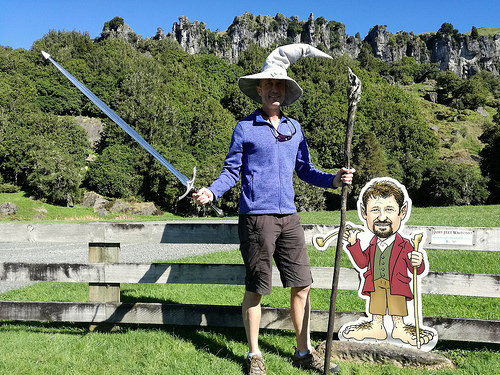 You can understand why Peter Jackson and his crew quickly fell in love with this place. 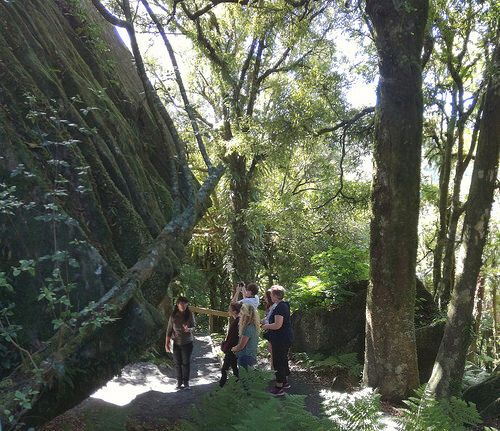 The ancient rock formations are perfect for ‘Middle Earth’, as are the prehistoric-looking forests. It really does make you appreciate just how stunning his country really is, with so much diversity. 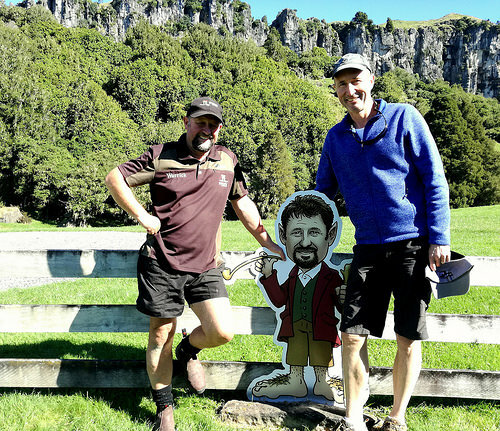 After a quick drive up a hill in a modern van, you can start following in the footsteps of the hobbits! How could anyone not be inspired by this magnificent scenery? You are surrounded on all sides by lush, rolling green hills. It really is Tolkien’s world bought to life. The best part of these tours is their small size. 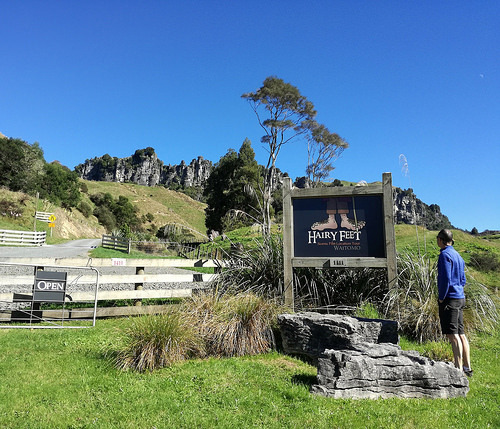 Visiting Hobbiton these days can feel a bit like sitting in a traffic jam, especially during the summer. By contrast, Hairy Feet Tours aim to offer a much more intimate experience. Our tour had just 9 people, which made it a very enjoyable experience. There isn’t too much walking, and there are plenty of stops on the way. 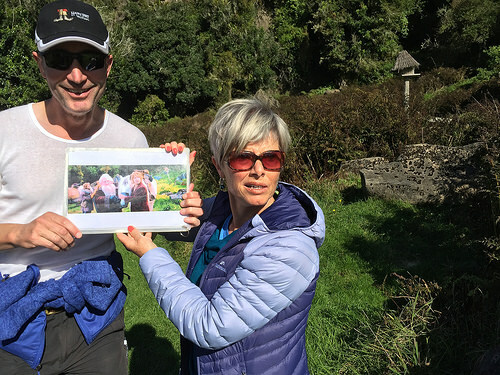 At each stop, Suzie holds up a still shot from a particular scene, which matches the area we were standing in at the time. It was a really neat way to show off just how much this area featured in the film. It certainly makes you want to view it again more closely! She invited each of us to recreate the same shot for ourselves. I tried to look like a worried Bilbo. I’m so pleased we captured the birdhouse in the background! Tom, Bert and William are such innocuous names for the revolting trolls from the Hobbit films. This was the very spot that poor Bilbo almost got cooked for their dinner! A tour like this is only as good and its guide. Suzie’s personal connection to the film really inspires you to see the film again. That has to be a measure of how successful this tour really is. We also have to mention Suzie’s husband, Warrick. A local artist was commissioned to recreate Warrick’s likeness as a hobbit. We think he did rather well! You can find more details about the tour here. Happy travelling with Hairy Feet Tours! 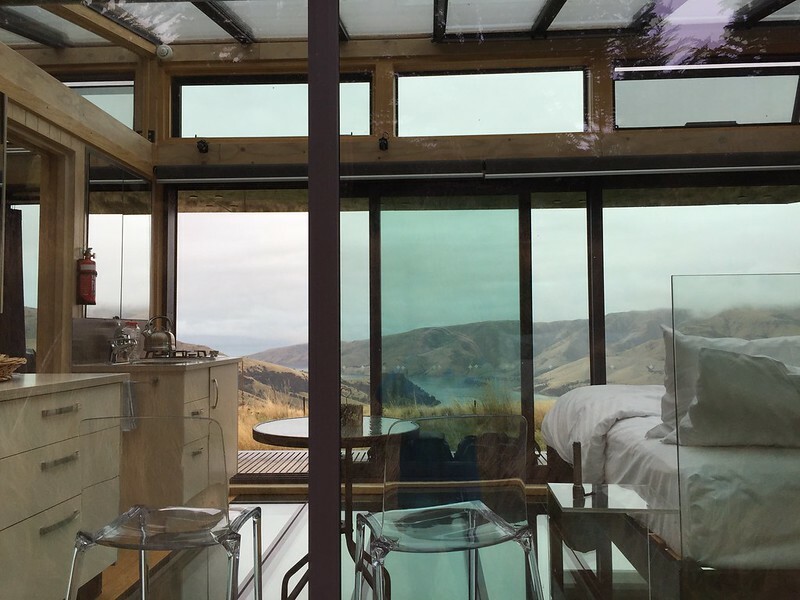 For romantic stays, in New Zealand, you’ll always find something incredibly unique. 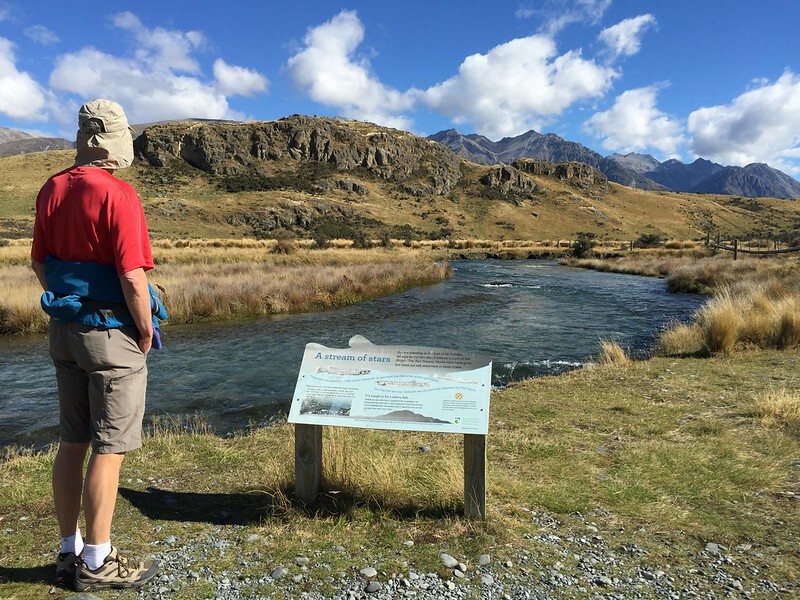 There are 7 very unique PurePods dotted around the Canterbury Region – you’ll get a fantastic choice of truly beautiful isolated locations. 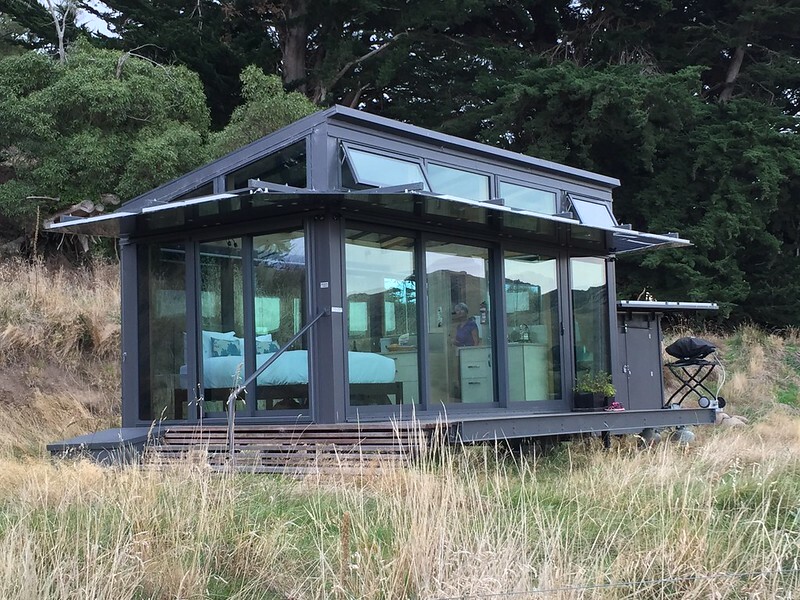 Just remember, PurePods are definitely not your usual tramping huts. In fact, PurePods are luxury eco cabins that are built of reinforced glass. These beautiful pods are totally powered by solar energy. Why are PurePods so unique? Can you imagine being about to see through a floor and ceiling made of glass? Well that’s what you’ll get with a PurePod. There are lights underneath the floor which you can turn on at night. But what is really the highlight for so many honeymooners, is being able to see the most amazing night sky. You will be literally miles away from any township, so the stars don’t have to compete with city lights. You can’t actually drive your vehicle right up to a PurePod. You will need to have an average degree of fitness for the 1.2 km uphill walk. It will take you a good 25 minutes. But don’t worry, the tracks leading up to the PurePods are well signposted. Just remember to arrive in daylight hours. There will not be any lights to show you the way if you arrive in the dark! 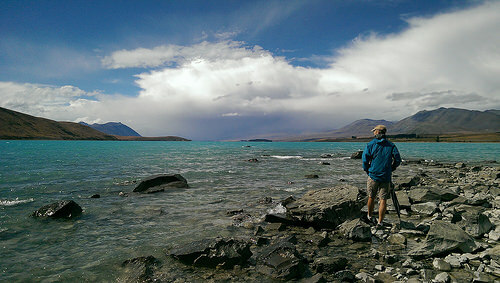 The greatest feature for our stay, was being surrounded by the most amazing landscape on all sides. 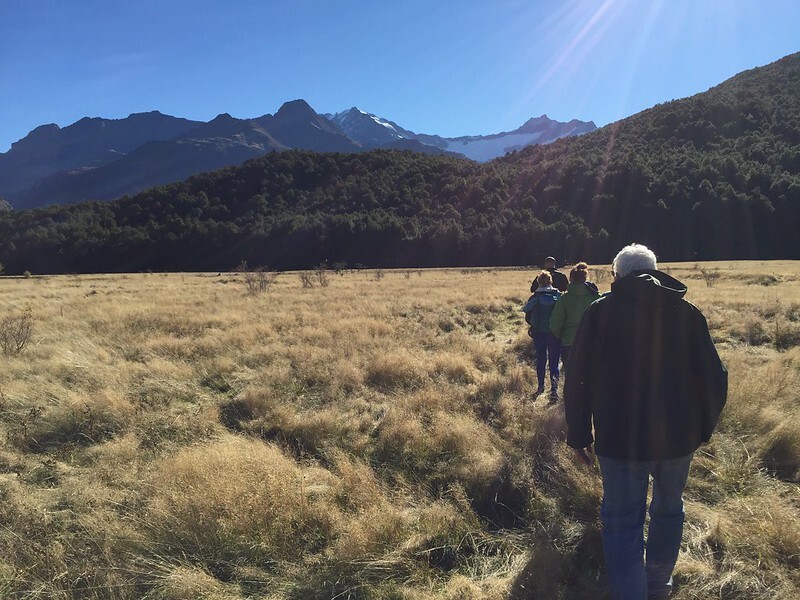 You’ll see the most beautiful views across the tussock grasses and rolling hills down to the long, sheltered bay of Port Levy. The morning bird life was wonderful. In fact, rural life goes silently on around you. You are the observer. How do you get access to a PurePod? 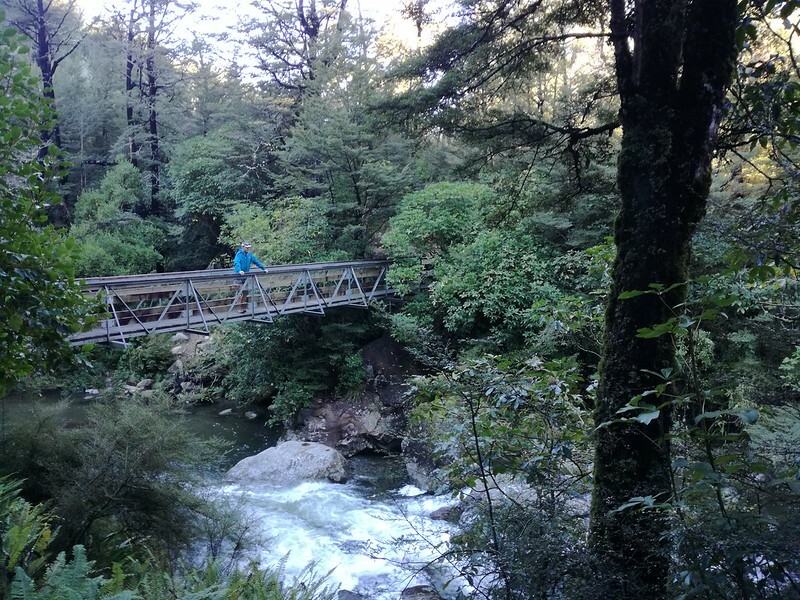 We stayed at the Pōhue PurePod between Darling Harbour and Pigeon Bay. This Pod overlooked Port Levy. At the booking stage, we were emailed a very clear map of how to get there and how long it would take. As with all the PurePods, we were driving along very scenic farm roads. There is a carpark at each PurePod location. From the carpark, there is a well signposted track. You need to be very selective about what you’ll take to the pod. After all, you don’t want to face a 25 min walk back to the carpark to get your food supplies! So it is essential that at least one of you has a backpack to carry all the stuff you will need. The beauty of the whole process is that you don’t have to check-in with anyone. In fact, you won’t see another human being for your entire stay. The door of the PurePod will be open for you, so just to walk right on in. At the bottom of the carpark, before you go up the track, there is a tiny open shed. 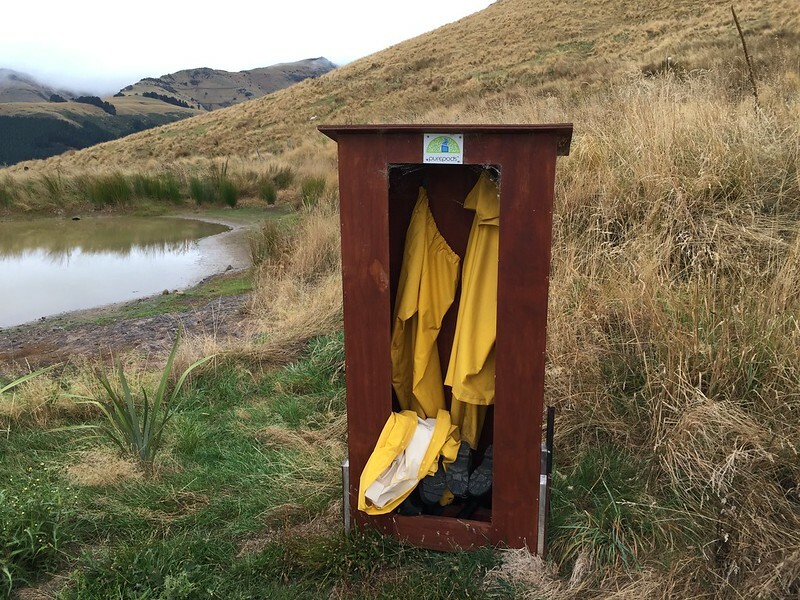 This shed contains wet weather gear. So if you arrive at the carpark and it is raining, just put a raincoat on and the gumboots that are provided. You will need to remove all your footwear and raincoats before entering the pod. The floor is glass and will become slippery if it gets wet. At an additional cost you can order food packages. However, we chose to carry up our own wine and food that we had purchased at a supermarket deli on the way. It was a fine feast! We also took our own breakfast supplies. Hence the need for back packs. With the exception of your food supplies, everything else is pretty much provided – including the kitchen sink! There is a barbie outside for cooking. Inside you’ll find all the kitchenware you’ll ever need. And you needn’t ever be cold. There is underground heating in the glass floor and heating above you. You’ll love the high-powered hot shower. You can use a shower curtain, but there really is no need. The bed is top quality to ensure a blissful sleep. You might want to ask yourself, how serious you are about getting away from it all. There is NO wifi connection, radio or television. But there is a USB connection for your cellphones. That way, you can also get to play your own music. I can pretty much guarantee you’ll quickly cast your cares away! If you have trouble adjusting to the vastness of the environment, there are night blinds. But on the night of our stay, we chose to keep these up. There is something very special about watching night fall and seeing an unobstructed sky. Remember, that with a PurePod, you’ll be totally isolated. You will only have each other. I guess that’s pretty much perfect for honeymooners and the romantic at heart. For a lot of busy couples, PurePods are a great way of reconnecting with nature and with each other. It’s a pure experience. 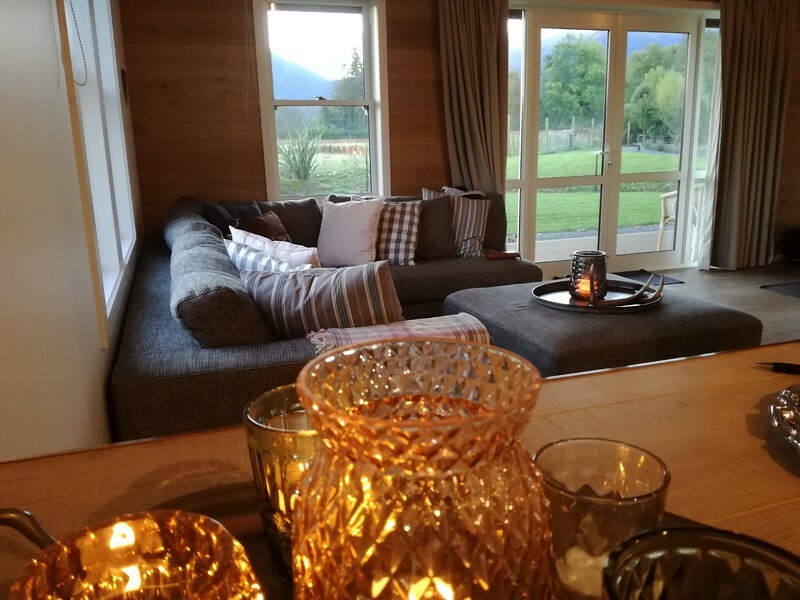 Check out some of our New Zealand honeymoon and nature focused self-drive itineraries, into we can incorporate a PurePod experience for you.